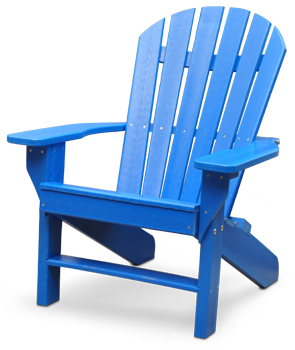 The Seaside Adirondack Chair is made from the highest grade, most eco-durable, 100% recycled plastic without any fillers. Built with extreme comfort in mind. Featuring a six-slatted contoured back, and a higher seat height for easy entry and exit. Matching side table and ottoman available. Connect two chairs with a Tete-A-Tete table top in between for refreshments, food plates, or reading materials. Prefect for outdoor dining at restaurants. Recycled plastic is virtually maintenance free. Pens and markers can easily be washed off, paint will not bond to the surface and can be removed with sandpaper. Surface cuts or scratches can simply be ironed away. UV stabilizers added to protect against noticeable sun fading. Marine grade stainless steel hardware included. Post-consumer waste such as milk jugs, pop bottles, and plastic bags are the main ingredients in this Adirondack chair, and to top it all off, the chairs themselves are also recyclable. Help reduce the pollution of landfills with chairs that can be enjoyed for generations to come.